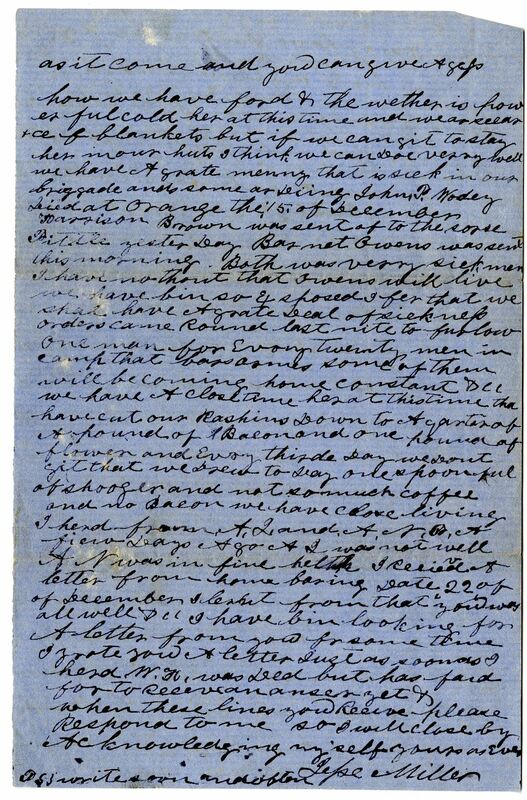 Item description: Letter, dated 3 January 1863, from Jesse Miller to William and Mary Proffit of Wilkes County, NC. He describes sickness, cold weather, and food rations in his camp. 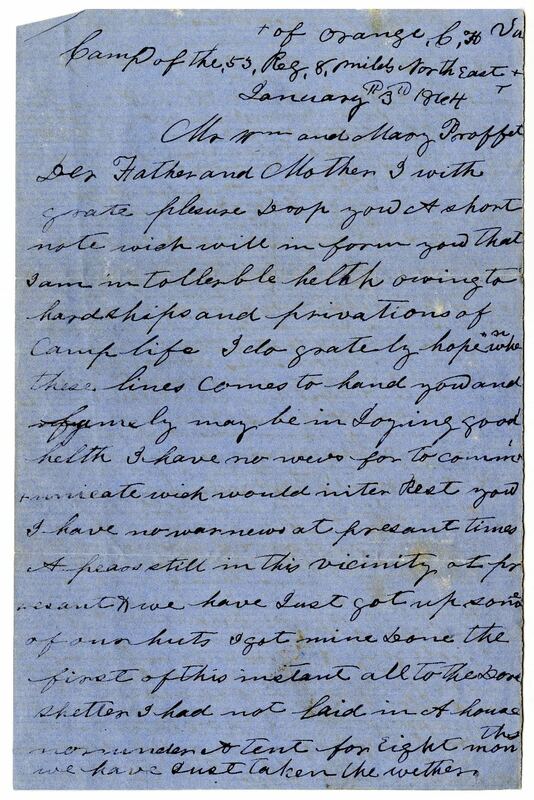 Dear Father and Mother I with grate pleasure drop you a short note which will in form you that I am in tolerable helth owing to hardships and privations of camp life. I do grately hoep when these lines come to hand you and famely may be Joying good helth. I have no news for to communicate wich would inter rest you. I have no war news at presant times & all is still in this vicinity at presant & we have just got up some of our huts. I got mine done the first of this instant all to the done shelter. I had not laid in a house nor under a tent for eight months. We have just taken the wether as it came and you can give a guess how we have fard and the wether is powerful cold here at this time and we are scarce of blankets but if we can get to stay here in our huts I think we can do verry well. We have a grate manny that is sick in our briggade and some ar dieing. John Wodey died at Orange the 15 of December. harrison Brown was sent off to the horse pittle yester Day. Barnet Owens was sent this morning. Boath was verry sick men. I have no thout that Owens will live . We have bin so exposed I feer that we shal have a grate Deal of sickness. Orders came round last nite to furlow one man for evry twenty men in camp that some of them will be coming home constantly. We have a close time here at this time. Tha have cut our rashions down to a quarter of a pound of bacon and one pound of flower and every thirde day we dont get that. We drew to day one spoonful of shooger and not so much coffee and no bacon. We have close living. This entry was posted in Southern Historical Collection and tagged furlough, hospital, illness, Orange Court House (V.A. ), Proffit family, rations, weather. Bookmark the permalink.